With today’s technology, the ability to create, design and distribute surveys has increased exponentially. This growth in technology brings a whole new host of options available to SMEs who are seeking to gain deeper insights from their primary research. In this article, we aim to shed light on 5 ways that small business surveys can help companies better understand their customers and improve internal processes. 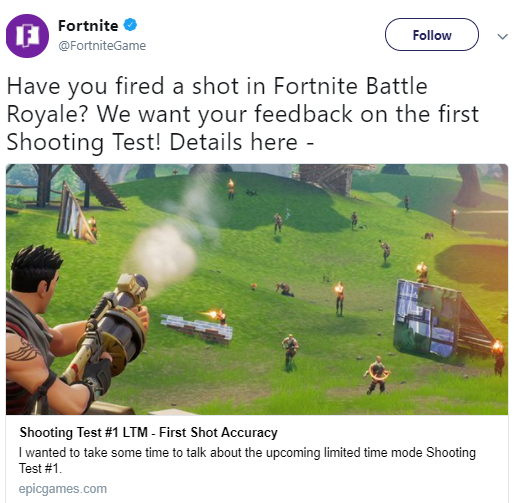 Indie developer Epic Games, creator of Fortnite Battle Royale, use online surveys alongside other data gathering techniques such as user analytics, community sentiment, and social analysis in order to gain deeper insight into how the audience feel about the company and their products. Using surveys as part of their strategy to manage how users perceive the game has been an important part of the development process for Epic Games, as the game is currently in early access which means that there is still a large amount of balancing and development to be done. Due to this feedback loop, the dialogue between company and audience has become of significant importance to the Fortnite developers, who rely primarily on first-hand feedback to continually improve the quality of their game. This approach has lead to a product that has been honed and refined in the interests of the wider community, and the conversation between players and company has ultimately lead to a better-finished product. It is this core focus on listening to the needs of consumers as well as adapting and implementing the requested changes that lead the developers of Epic Games to have a keen competitive advantage over others in the online battle royale genre. As a method of gathering large volumes of feedback from your audience, surveys are a highly useful market research tool for small businesses that can be administered for a relatively low cost, in comparison with other methods of data collection. This makes surveys highly useful for more agile brands such as UK clothing line Bowlcut Garms, who regularly use surveys to gain a variety of marketing insights. 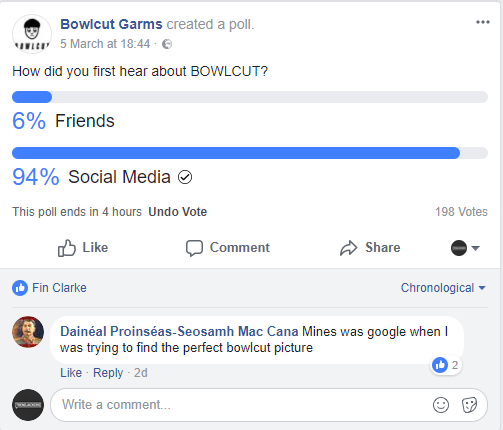 In the past, Bowlcut has used their platform on social media to collect first-hand survey data in areas such as what products customers prefer, or how audience members first heard about the brand. This practical feedback can then be used by the brand to inform their overall product line, and will also provide a wealth of easily understandable data for the team to continue to finetune their strategy in the future. (!) However, it would be wise to note that in this example, these questions have been asked solely via Facebook and therefore it’s logical to assume that these users may respond differently to those who are surveyed through different channels, such as Twitter, Email or on the phone. Therefore if you are looking to replicate a similar approach, it is always advised to distribute the survey through multiple channels to reduce any bias that could skew your results. 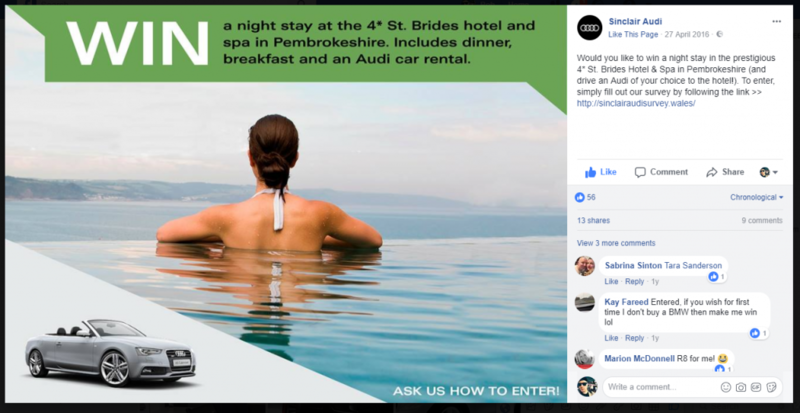 Welsh automotive dealership, The Sinclair Group employed their sales staff to collect demographic data, the age of car & contact information from customers who visited their showroom by enticing visitors with a competition to win a luxury holiday package. The survey URL was loaded up on each of the salesmen’s mobile device, and an incentive to collect the most responses motivated staff to incorporate the survey into their regular work-flow. 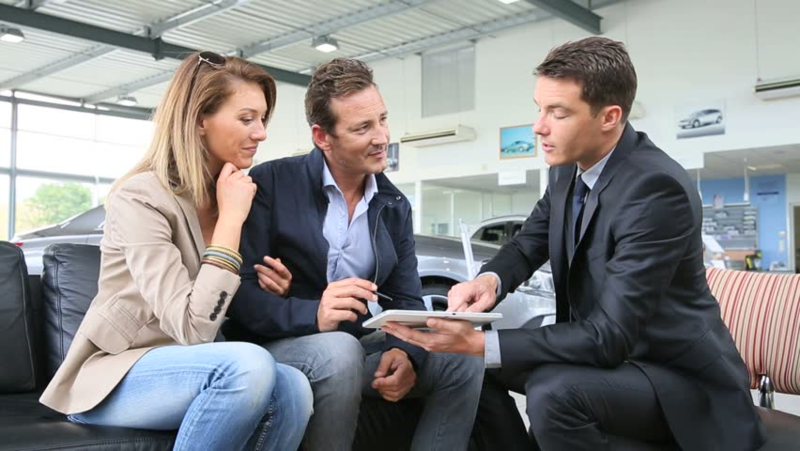 The survey was primarily distributed within the car showroom, however, the competition offer was also circulated to new audiences on social media via a promoted post within a 10 km radius of the dealership, allowing the brand the opportunity to attract new prospects who hadn’t visited the store. The primary goal of this survey was to collect customer data, and once the customer data had been obtained and filtered, these leads were redistributed back to the sales team which provided them extra customer information needed to close sales. Furthermore, the competition offer also received significant traction on social media which boosted awareness for the brand and increased the groups social following. 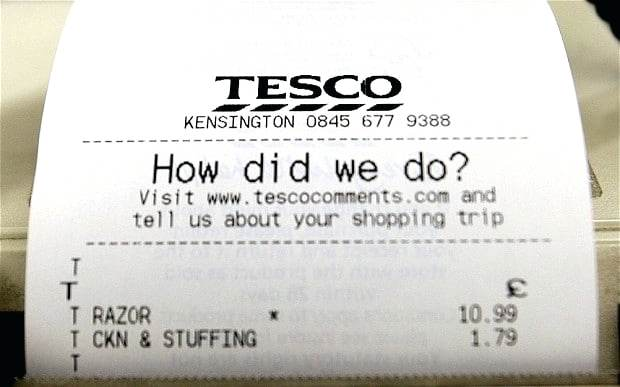 Surveys can also be used by small businesses to prompt customers into giving feedback regarding their experience after a sale has been completed. Typical methods of distribution for post-sale surveys include placing a survey link on the customer’s receipt or by sending an email to customers shortly after their order. One of the major key benefits of this approach is those survey invitations are sent automatically. This drastically reduces the cost as it requires no researchers or in-store staff to distribute the survey. Over time, a customer satisfaction survey can help businesses identify and correct customer service failures. However, one limitation of this type of survey is that it can often be used as a vehicle for customer complaints and grievances from a small segment of the most vocal customers. Nevertheless, the feedback obtained from a post-sale survey may help a business to improve customer handling as well as to identify any other issues that the company may otherwise not have been aware of. Quizzes are known to be one of the most underrated, but effective forms of marketing content that you should try. Brands like BuzzFeed invest a lot of time and energy into creating highly entertaining surveys that use a quiz format. This benefits them by keeping site visitors more engaged which keeps them on the BuzzFeed site for longer. The quizzes often come in two distinct styles: personality quizzes such as “Which Netflix Series Should You Watch?” or knowledge-based quizzes such as “How Much Do You Actually Know About Astronomy?”. Personality quizzes can allow you to collect extra customer data which helps you to better understand your audience and inform your future marketing decisions. On the other hand, knowledge-based quizzes help you to gain a quick grasp of your audience’s understanding on a given subject matter and can help to increase your audience’s knowledge retention over time – which makes them perfect for training, or education based services. Both styles can be used by small businesses during the lead generation process of your sales strategy to funnel customers to the correct landing page or to collect customer information that will help in a sales context. If you are looking to use quizzes in an upcoming campaign, services such as Survey Anyplace provide easy to use software that helps small business to easily create and design stunning quizzes that can be embedded on your website or distributed via your social media channels. And there you have it. 5 very different ways that surveys can be used by small businesses to improve their marketing and sales processes. Who knew that small business surveys could be implemented in so many different and creative ways? By looking further into some of the examples discussed in this article, you should begin to understand how effective surveys can be for businesses in any industry. So don’t let surveys fly under the radar of your marketing team any longer, try to incorporate them into your upcoming campaigns and see just how effective they could be for you. Just make sure they offer your audience an interactive and engaging experience, rather than becoming a boring task. If you’ve got a survey marketing success story you’d love to share with us, let us know in the comments or get in touch with us to share your story on social media. 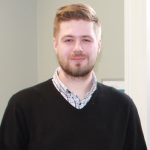 As a member of Trendjackers, Rob approaches marketing not only in a professional manner, but also as a creative outlet.Find out more from Trendjackers and read their insights over on their blog.